Do you remember what you were doing on 9/11? Today's weather was exactly the same as that fateful day that shocked the world. I remember I was heading into work a little later than normal because my wife was working in the city and had to wait for my mother-in-law to arrive to watch our infant daughter. I was driving down Rt 35 in Katonah, NY when someone on the radio interrupted the program to say that an airplane just crashed into the one of the World Trade Center Towers. And then another report on another plane crashing into the other tower. I don't think anyone could get any work done that day. The weather that day was just like today. A beautiful day for a bike ride with my boys down to Wolfe Park in Monroe. 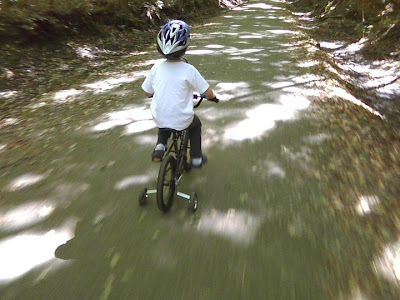 The mistake I made right off the bat was that I should have went for the kid trail: bike + trail-a-bike + Burley Trailer, because I really want my oldest son, Elliot, to get into biking so we could ride together. He, on the other hand, still isn't into it, so it was a battle to continually switch off between the two. Both boys love the trail-a-bike and I realize now that I should have purchased the tandem version. At first Elliot was enjoying the ride. Then we switched and Brodie was doing OK at first but quickly tired. To get back to the parking area I had to bribe Brodie with $5 in quarters but the little guy rode all the way back to the parking lot!